These laminated target grips feature a thumb rest, a heel rest and finger grooves. The Grips are designed to give the shooter a more relaxed and steadier hold. Grips are CNC machined from laminated wood and include an extended magazine release and four Allen head screws. 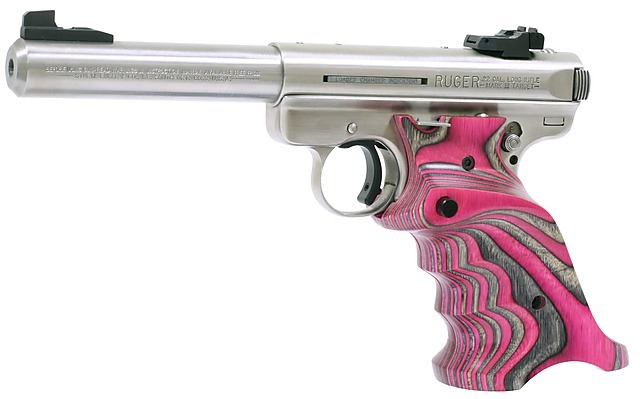 These grips will not fit the Ruger 22/45 model of the Mark III. Please Note: These are production grips so the grips you receive will not be the individual pair shown in the photo. Our photos represent the type and general character of the material but due to variances in the material colors and layer thicknesses, the visual appearance of the grips may be different. Also note that colors shown of computer monitors can vary greatly, affecting the representative colors.